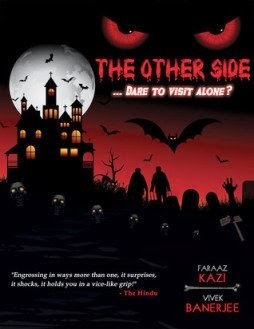 Synopsis: ‘The Other Side’ is a collection of thirteen tales of the paranormal world; a world that our eyes refuse to see, our ears deny hearing and our senses ignore the feel of. This is a book for someone who is brave enough to take up this invitation to journey through uncharted waters along with the authors, who were inspired by some bizarre experiences to pen down this work, where the lines of reality have been blurred by the footsteps of imagination. Each story takes the reader on a tour de force of unadulterated horror and draws upon the deepest tear in the human mind – the fear of the Unknown. Review: I have never read horror till now and so when I received the opportunity to read and review the book, I grabbed it with both hands. From being publicized a lot, be it online or through book launches, ‘The Other Side’ has definitely garnered lot of hype around it. And when you have the synopsis like above and ‘Hindu’ quoting it to be engrossing, surprising which comes to shock you and you are in a vice-like grip then one must be pretty sure that the book has substantial material on offer to the readers. But sadly, it doesn’t. Out of all the thirteen stories that the book has to offer, only one story was able to spook me and give goosebumps and that is ‘A Mother’s Love’. Rest all the stories are even below mediocre if I may say so. There isn’t an iota of spookiness in the stories, forget the unadulterated horror that the synopsis quotes. Though I have to credit them for coming out with thirteen different tales that dares you to visit alone but it simply falls flat. I felt the stories lacked behind in imagination as where there is no imagination there is no horror. I had planned of writing a short review of all the thirteen stories but after reading the book I felt it will be a monotonous exercise to simply state that the story didn’t spook the living day lights of me. The only positive thing in the book I felt are the quotes before the start of each story and it is nicely proof read making it a bit more interesting to read. Overall: Yes, one can dare to visit alone even at night and wake up without having nightmarish and spooky dreams. It hardly evokes fear in you.